Making a major impact to every basic combat operation in Arma 3, Marksmen is a substantial and successful overhaul. Bohemia Interactive is upping the stakes with each new update. What began with Arma 3’s quirky but basically inoffensive go-Kart DLC and grew into an overhaul of Arma’s flight physics model has now hit the big-time. 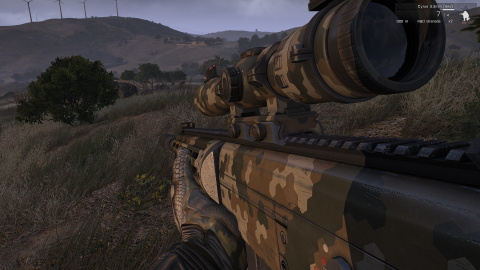 Arma 3’s third DLC, Marksmen, is by far its most ambitious, rebuilding the ballistics, sound, and weapons handling. The boots-on-the-ground experience for Arma players has been vastly improved—and almost all of it is free for everyone. The flagship feature of Marksmen is the ability to stabilize weapons. This has been one of the most requested features by the community for a long time. Though mods since Arma 2 have featured bipods, none of them work as smoothly as Bohemia’s new in-engine mechanics. There are two ways to stabilize a long gun in the new Arma. The first is passive: by approaching any level surface, soldiers now rest the barrel of their guns on that surface for stability. This happens automatically and is represented by a box outline in the player’s stance window. In practice, this means that kneeling behind cover and kneeling in a field is no longer the same thing. Keeping behind cover isn’t just a smart life choice, it’s now a huge offensive advantage. The best thing about this stability bonus is that it happens almost everywhere, at any height. Behind a chest high wall? Stabilized. Stretching your neck over a taller wall? Stabilized. Stability that used to come only from the prone position is available in a variety of postures, and I found that Arma’s detailed world was suddenly packed with fantastic firing positions. Execution of this idea is a little bit uneven at times, particularly around the low stone walls that dot Stratis. Sometimes I could rest my rifle on the wall only if I looked down and to the left, or I had to take a half-step away from the wall before it registered. The second way to stabilize weapons in the new Arma is to equip and deploy a barrel-attached bipod. This is probably unnecessary for rank-and-file rifle slingers, but squad marksmen, snipers, and autoriflemen will discover a new love for their weapons with a bipod attached. My greatest fear about this feature was that deployed weapons would feel all wrong, firing like motionless laser pointers, but the mechanics of firing feel great. Weapons still kick while deployed, but the aiming reticle keeps steady enough to maintain a good connection to the target. Though deploying the bipod locks the rifle into a narrow field of view, the ability to put rounds down range without wrestling with a swaying reticle makes any special weapon a much deadlier tool. Arma continues to revise its training and tutorial programs to bring new players up to speed, and Marksmen packs a lot of new ways to train. A set of Virtual Reality training classes cover the basics of aiming and leading targets, while also touching on the importance of picking the right weapon for every situation. Though veterans should take a run through these, they’ll be most useful as an expanded boot camp for new players. Weapons have been given new handling physics, and this affects how they aim. Longer, heavier guns with more attachments bolted onto the barrel take ages to swing around and line up. For the first time, I finally felt like submachine guns might be more useful in a close-quarters fight than pulling a Rambo with a hip-firing machine gun. When it comes to clearing rooms and swinging around sharp corners, the heavy hitters are at a distinct disadvantage to the diminutive 9mm chatterbox. At every step, the new simulation for Arma’s helicopters made them less of a one-size-fits-all proposition. Marksmen is doing the same for Arma’s guns. I once felt like I was “shooting a rifle,” but now I feel like I’m “shooting a Mark 14.” Every gun feels and shoots differently, and they all have their own particular character. It’s impressive stuff. Up until now, everything I’ve described in this review is part of the free update for Arma 3. Every player gets to stabilize their weapons in multiplayer and check out two new single-player missions, free of charge. As in the Helicopters DLC, Bohemia has set aside some fancy new toys for the paying customers, and they are some gorgeous machines. The NATO forces get new sniper rifles and an assault rifle that looks a lot like the current American military workhorse, the M4. Interestingly, insurgent forces get another rifle from American stock, the Korean War–era M14. Though it’s a powerful, versatile rifle, the M14s in Arma look and feel like they’ve been seeing heavy service for seven decades. The M14 also showed up in Arma 2, and it’s a great retro throwback for Arma 3’s near-future setting. My favorite premium addition is a selection of Russian-style rifles with built-in silencers. Based on the VSS assault rifle, the Kir rifle is lightweight, almost spartan in design, and has a thick barrel to support the silencer. It sacrifices any sort of long-range capabilities, but for silent night raids, the Kir is an assault rifle that doesn’t become unwieldy in close range. The variety and detail of all of the new weapons, in fact, show that a lot of thought went toward integrating them into the overall Arma ecosystem. Combined with sniper-friendly ghillie suits, special autorifles, and new carrier rigs, there’s a lot of great stuff behind the paywall of this update. The way Bohemia is rolling out new content without fracturing its playerbase, while still rewarding paying customers with some special gear, really should be applauded. When I’m thinking about paying $16 for, basically, a few new rifles and a uniform made out of grass, the good faith shown by the developer toward its community goes a long way toward making me happy to cough up some cash. Even lone snipers appreciate a ride home. Nice car. I’ll take it. The virtual arsenal is still the best way to play dress-up with your lethal dolls. The new long-distance training simulation helps new snipers learn the ropes. One of the new training missions has you sort through trash by flashlight looking for mines. It is... intense.